TNG :: A new instrument at TNG: GIANO, the high resolution infrared spectrograph. A new instrument at TNG: GIANO, the high resolution infrared spectrograph. From today a new instrument is available at the Telescopio Nazionale Galileo, for the Italian and international astronomical communities. 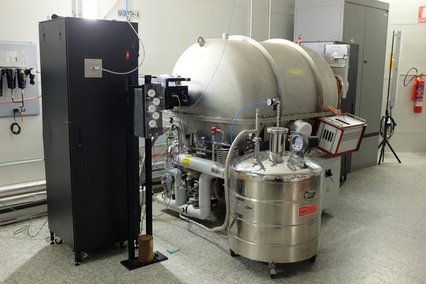 GIANO, a high resolution spectrograph (R~50000) has been installed and integrated in the set of instrumentation at TNG. It was developed at INAF-Osservatorio di Arcetri and it is the first instrument in the world capable to obtain a complete infrared spectrum in a single exposure. "GIANO has become a reality for observations, now it is the time for science to step in, with several new programs that the community is eager to start" says a satisfied project PI Livia Origlia (INAF-Osservatorio di Bologna). Ernesto Oliva (INAF-Osservatorio di Arcetri) adds that "with this project we open an important phase of technological experimentation on new materials and optical components, in sight of the next generation of infrared instruments for the large telescopes". The Science Verification process was completed during last September in la Palma, and astronomers from various Italian institutes took part in it. Now the spectrograph is available for the forthcoming INAF call for proposals and later for other international calls. Emilio Molinari (director TNG) is sure that GIANO is " the missing piece in the spectroscopic offer by TNG and the all la Palma telescopes". From INAF Scientific Directorate, Paolo Vettolani congratulates "the GIANO Team and TNG personnel who turned into reality a complex and innovative project".